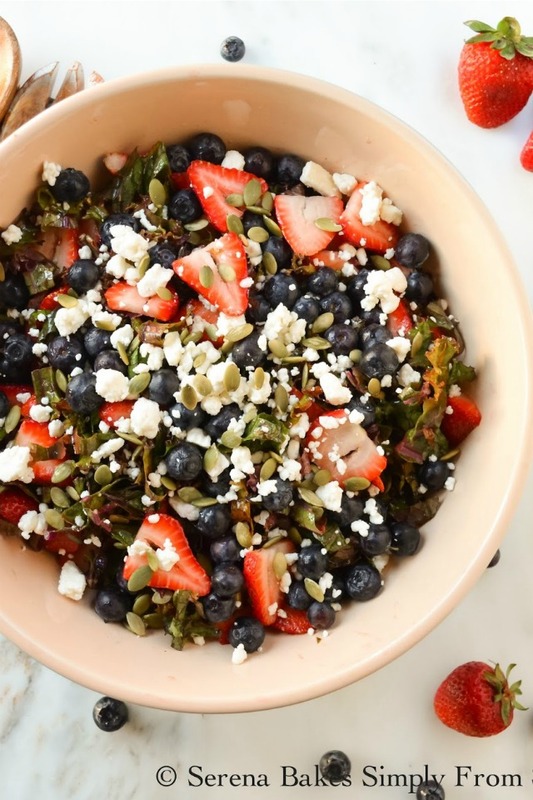 We've been grilling a lot lately because the weathers been gorgeous and Kale Strawberry Blueberry Salad is amazing with just about anything off the grill. We've enjoyed it multiple times in the last week and I'm pretty sure I'm going to face plant into another bowl tonight. 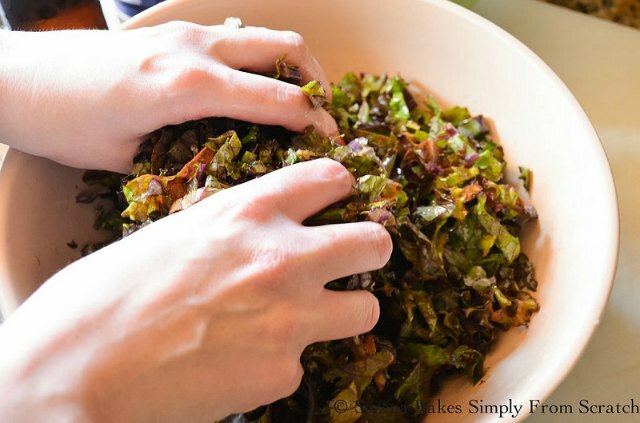 Kale salad is one of those salads that holds up beautifully at a barbecue or picnic since the kales hardier than lettuce and doesn't wilt as easily. Most nights I prep the salad before Colt gets home so we can sit on the patio and read our books while he starts the charcoal. I just finished reading Cinder by Marissa Meyer after Lorna suggested I had to read it and moved on to Scarlet. So far I'm totally loving the series and the fact it gives me something to talk with her about. To me it's the little things in life that make me happy..
Like a big bowl of Kale Strawberry Blueberry Salad on the patio with a book and lots of sunshine. It couldn't get much better then that. 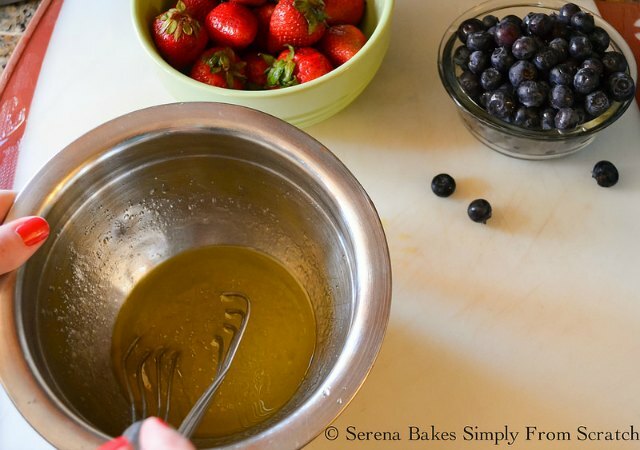 In a small bowl add 3 tablespoon Champagne Vinegar and drizzle in 1/4 cup Extra Virgin Olive Oil while whisking to form an emulsion. Add a generous pinch of salt, pepper and a teaspoon of honey. Thinly slice 1 bunch of kale and drizzle with vinaigrette. We've been having gorgeous purple kale at the store the last few weeks but any variety you have will work. 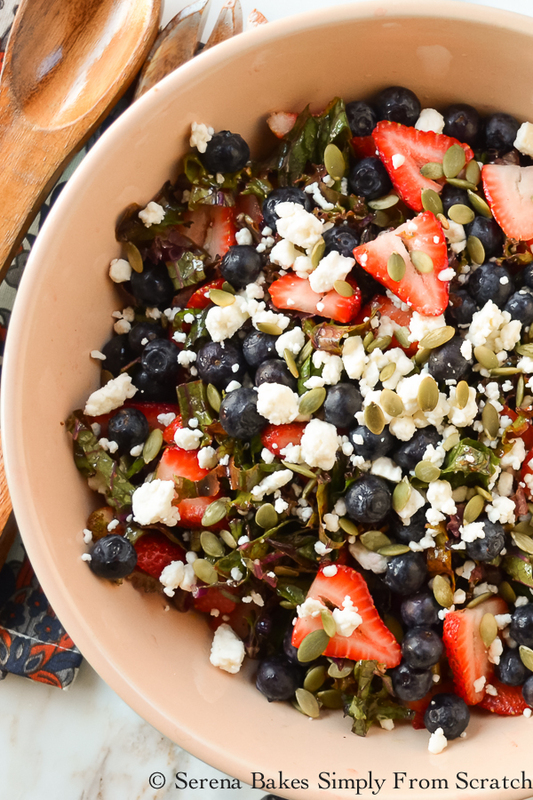 Add 2 cups sliced strawberries, 2 cups blueberries, 3/4 cup feta and 1/2 cup Pepita Pumpkin Seeds. Serve immediately or place in fridge until ready to serve. This salad serves 5 generously or 2 as a main course. I'm off to go make another one of these for tonight! I hope you love it as much as we do. 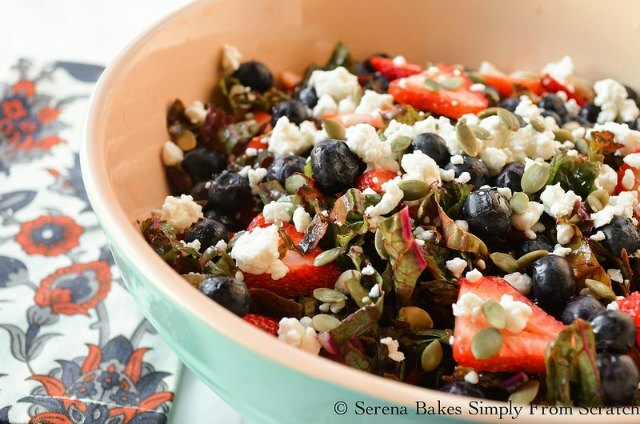 Kale Strawberry Blueberry Salad is an easy to make, healthy salad that holds up well for picnics and barbecues from Serena Bakes Simply From Scratch. In a small bowl add champagne vinegar. 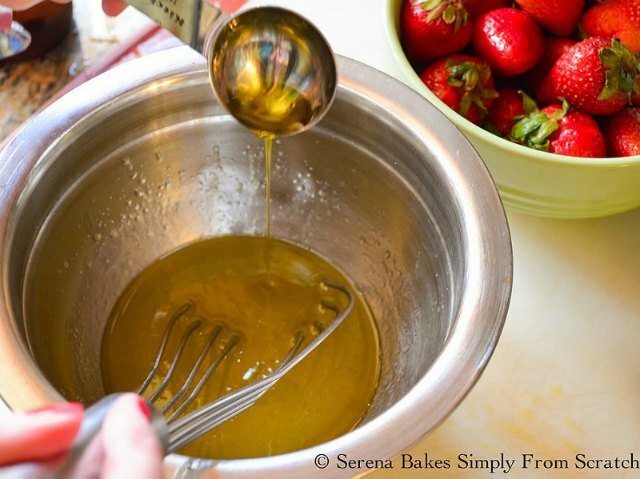 Slowly drizzle in olive oil while whisking to form an emulsion. Add honey, salt and pepper. Whisk until well combined. Drizzle dressing over kale and massage until kale is well coated. 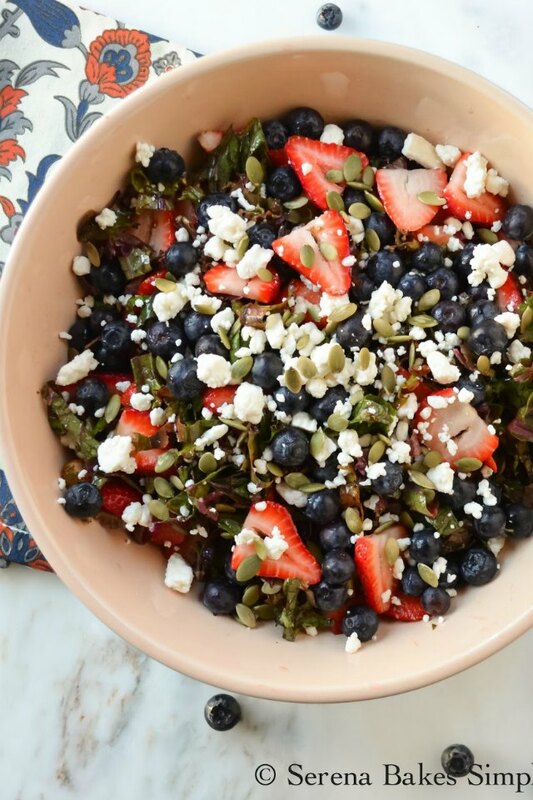 Add strawberries, blueberries, feta, and pepita seeds. Serve immediately or refrigerate until ready to enjoy. This looks so fresh, healthy, colorful and delicious! I can see why you have had it several times in one week! This looks yummy! I love strawberries and blueberries. Thanks for stopping by Granny's Down Home Sassy Southern Cooking and your thoughtful comment. That sounds delicious. I"ve been looking for new a Kale salad recipe! This is perfect! Looks amazing! Always looking for salad inspiration. YUM!